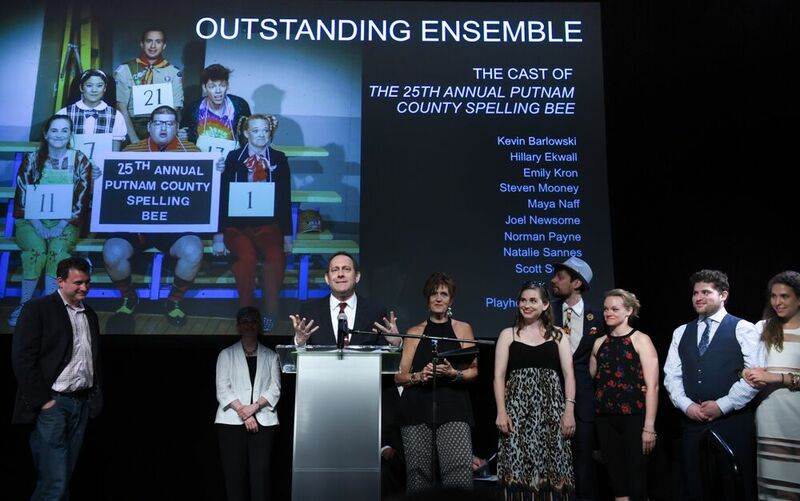 In an evening filled with heartfelt moments, the Connecticut Critics Circle presented it 25th annual awards for outstanding theatrical achievements at Connecticut’s theaters during the 2014-15 season. For those keeping score, the production of Hamlet at Hartford Stage won the most awards, picking up accolades for sound, as well as featured actor in a play, lead actor in a play, outstanding direction and best production of a play. 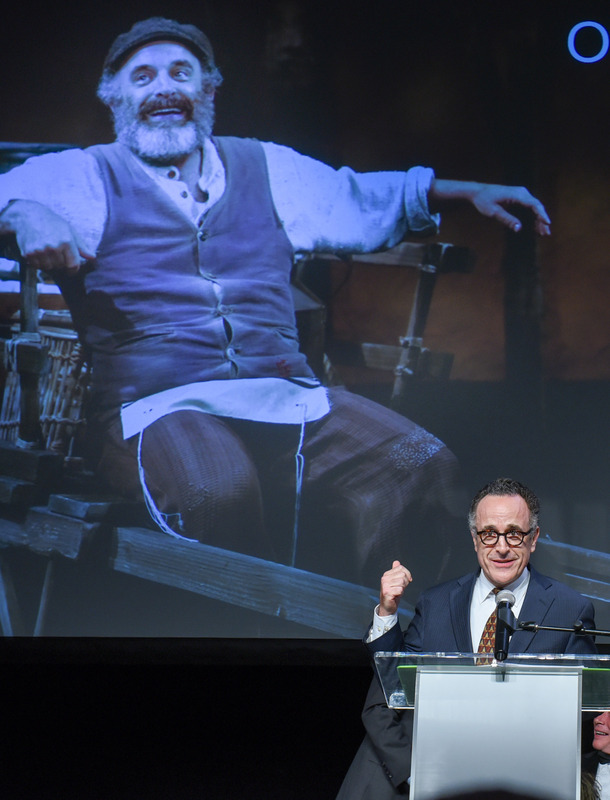 The musical awards were split with Fiddler on the Roof which was produced at Goodspeed, winning awards for lead actor and director, but Holiday Inn also from Goodspeed winning for outstanding production. The awards were presented at the Yale’s Iseman Theater in New Haven with an audience of almost 200 looking on. The awards were considered a special event in connection with the International Festival of Arts & Ideas. Several of Connecticut’s smaller theaters also had impressive wins with Playhouse on Park in West Hartford winning best ensemble in their first year of eligibility. Ivoryton Playhouse scored with the outstanding leading actress in a musical. Both has multiple nominations. Long Wharf, Yale Rep and Westport had nominations for multiple shows and scored victories. Long Wharf won for best ensemble for Picasso at Lapin Agile (it was tie vote),lead actress in a play for Bad Jews; Westport won for featured actor in a musical for Sing for Your Shakespeare and Yale won several awards for Elevada and featured actress in a play for Arcadia. 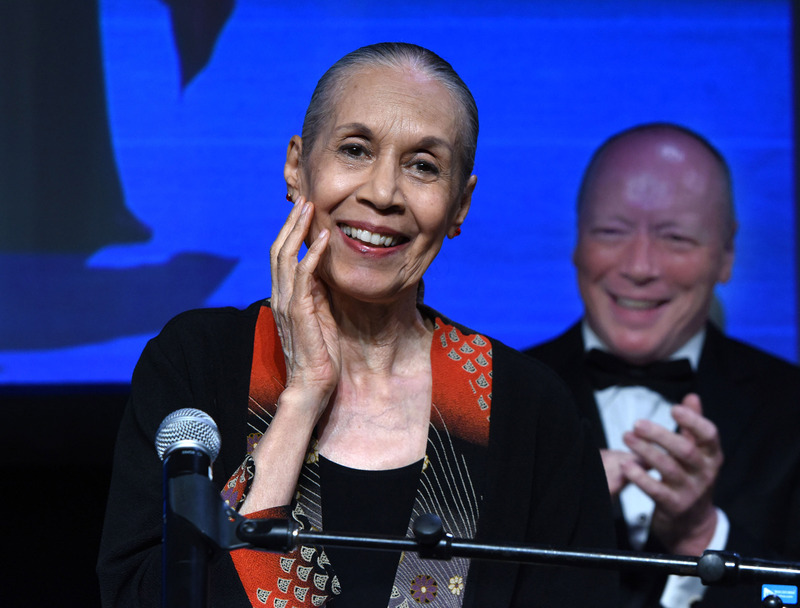 The Killen Award for outstanding contribution to Connecticut theater was presented by James Bundy, dean of the Yale Drama School and artistic director of Yale Rep, to Carmen de Lavallade. 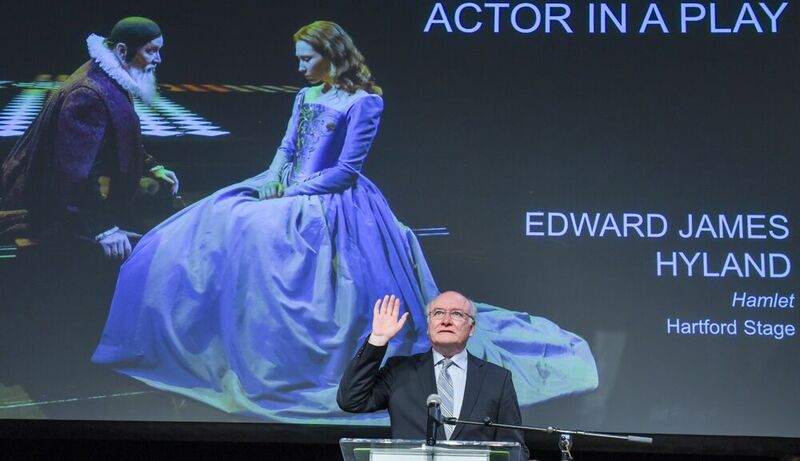 Included in his remarks was a note from one of the Drama School’s most illustrious graduates Meryl Streep who wrote about the impact de Lavallade had on her as a student. An internationally acclaimed dancer, de Lavallade was on the faculty of the Drama School as well turning in memorable performances in both A Midsummer Night’s Dream and The Tempest. De Lavallade seemed overwhelmed by the award as she expressed her thanks. Talking about her experiences at Yale, she called it both “magical” and “a turnaround” and said it was an important “growing period for me.” She ended by saying she is still learning and will continue to learn. Zach Appelman who won for the leading role in Hamlet, was not present but in his note thanked not only Hartford Stage and director Darko Tresnjak but also James Bundy and Yale Drama School for all they taught him. Rebekah Brockman who won featured actress in Arcadia, also was working elsewhere but thanked her director James Bundy for as she putting “letting me explore my voice within the text and guiding me when I was lost.” Brockman received a second nomination in that category for her work in The Liar at Westport. More than a few audience members had damp eyes when a special award was presented to the Summer Theater of New Canaan for its DramaRama program. This program now in its 5th year, pairs theater interns and professionals with children with an assortment of disabilities and helps them put on a show in front of a live audience. In accepting the award, Executive Producer Ed Libonati told of the positive outcomes — the young person who never spoke but did so on stage and the others who have participated in school and community productions. Another special award went to Shawn Boyle for his projections in the Yale Rep production of Elevada. New Haven’s A Broken Umbrella Theater — recipients of a special award last year — presented a special award to The Split Knuckle Theater and its production last June of Endurance. 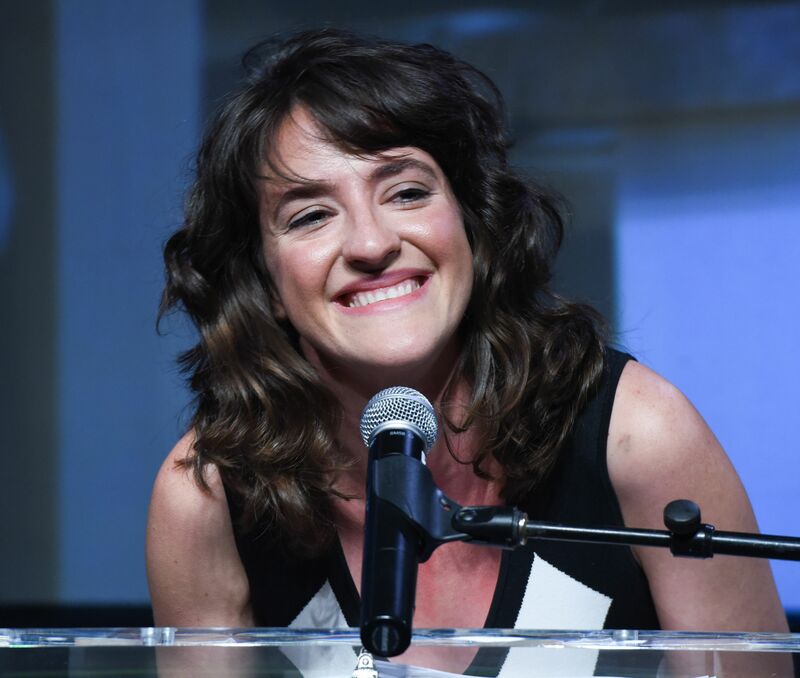 Keilly McQuail who received the outstanding leading actress in a play award for Bad Jews at Long Wharf, told of growing up in Newtown and attending the Arts High School on Audubon Street in New Haven. Perhaps the funniest line was from Steven DeRosa who won for his featured role in the musical revue Sing for Your Shakespeare at Westport Country Playhouse, when he said that if his mother were alive, she would say that the critics “had excellent taste.” He also recalled his first professional production which was at Hartford Stage and his training at Yale Drama School. The evening closed with the presentation of the best directors and outstanding production awards. 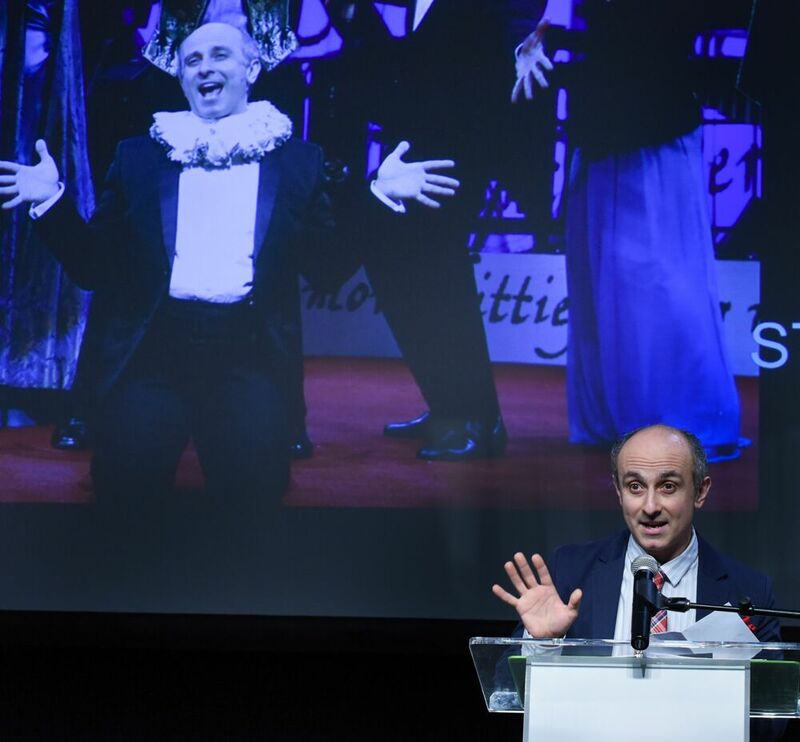 Holiday Inn won best musical and Gordon Greenburg its director and co-writer told the audience that it will have a national tour next year. 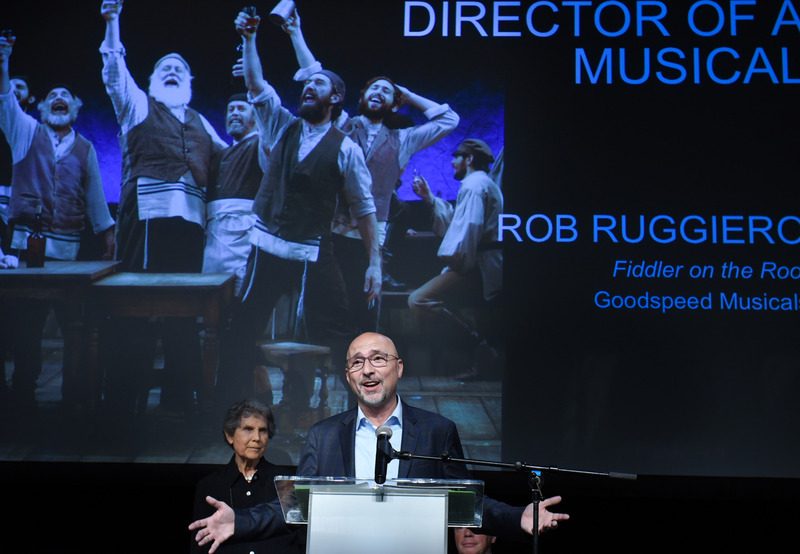 Rob Ruggiero was named outstanding director for Fiddler on the Roof and mentioned the contrast between that show and his current project, La Cage aux Folles at Goodspeed which begins performances this week. Darko Tresnjak won for best director of a play (Hamlet.) Tresnjak sent a note since he was visiting with his very ill mother before going to San Diego’s Globe Theater where his production of Kiss Me, Kate will open soon. Already the Connecticut critics are reviewing shows and making notes of outstanding productions, technical achievements and acting for next year’s awards.